PARALYMPIAN OSCAR PISTORIUS is back in court today for the second day of his pre-sentencing arguments. Yesterday marked the first day that he was back in court after being found guilty of negligently killing his girlfiend Reeva Steenkamp on Valentine’s Day 2013. Pistorius, a double amputee, was cleared of the charge of murder. Yesterday, South African prison official and social worker Joel Maringa, recommended that Pistorius clean a museum in Pretoria for 16 hours a month as his punishment. But Prosecutor Gerrie Nel described Maringa’s suggestion of this community service as “shockingly inappropriate” yesterday. Pistorius’ therapist told the court yesterday that the 27-year-old athlete suffered “genuine remorse” after shooting dead Steenkamp in 2013. The sentencing hearing is expected to run for most of this week. 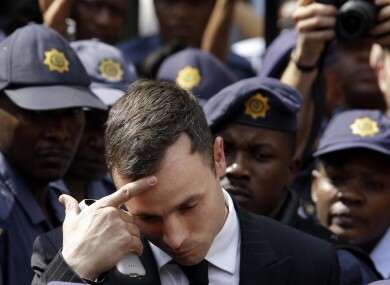 Pistorius could face up to 15 years in prison – or he could avoid prison and be given a non-custodial sentence. The court hearings will continue to be broadcast live on television and radio. Email “Court to spend second day deciding how Pistorius should be sentenced”. Feedback on “Court to spend second day deciding how Pistorius should be sentenced”.